LELAND, NC (WECT) – For some students going to class every day can be a challenge, but not for an eighth grader at Roger Bacon Academy. 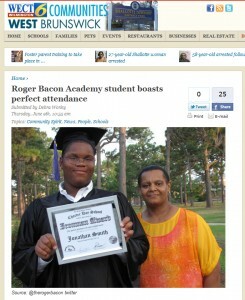 According to school officials, Jonathan Smith had perfect attendance from kindergarten thru 8th grade! He was presented with the Ironman Award Wednesday night for his hard work. School officials say Smith always has a postiive attitude, works hard at school and gets along with everyone. He plays guitar in the school’s band and is an Eagle Scout. Congratulations Jonathan, on a job well done!